Mirror, mirror on the water, tell us carp are where they outter (be). I met Mario and his friend as they rode their bikes under the Hyperion Bridge. When he called to me, at first I felt unnerved. Then, looking around, I felt foolish to think that this bright-faced boy might be up to no good. “Fly fishing?” he asked with a knowing smile. “Got a good spot?” I answered in return. And off we went, two kids who might have been Tom and Huck from earlier days, and an older gentleman, two on bikes, one on sneakers, plying the waters of the Glendale Narrows. Shortly, we came to Mario’s spot, which is one well known to the bait guys. In fact, we watched from the other side of a long island as one of them hooked up. “Nice fish,” I shouted cupping my hands against the wind and background noise. As we wheeled and walked to a spot I knew, I told the boys to keep a sharp eye out for fish. 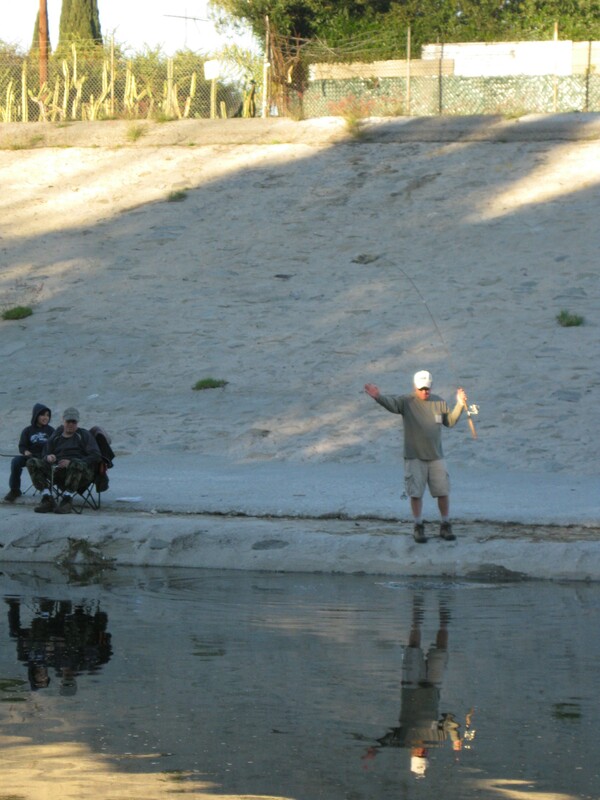 Now that they’d seen a carp, they realized I wasn’t just telling them tall fish tales. And, sure enough, we spotted a bonnie golden bonefish as he pushed up a concrete step, the swift water parted by his muscular body and slashing tail. “Told ya,” the old guy answered back. Then, I cast, cast, moved my indicator, cast, fooled with my weight, cast. Not a strike. Soon, the boys got bored, which Mario said happened, but that it was worth it because of the thrill of the catch. They wanted to cross to the other side, so that we’d be closer to where the bait guys were hooking up. The thought of wading in that cold, questionable water didn’t thrill me, and we parted company, as they decided to stay on our side of the river, and go home for sandwiches. “When you usually here?” Mario asked. “Fridays,” I answered. The three of us shook hands, and then shook our heads in agreement, that we would meet again one of these Fridays, and, possibly, Mario would bring his dad along. Being skunked is a quiet ticket to unhappiness and frustration, unless you meet some new buddies during the process. I fished out the day without a strike, yet as I walked back to the car, empty-handed, I thought about my two new friends. Fishing, after all, isn’t always about catching … If I’d seen them on the sidewalk, in the mall, or in a restaurant, I doubt we would have ever said a word. Yet here, in our defiled river, we three strangers became just a tad better acquainted than when we arrived. 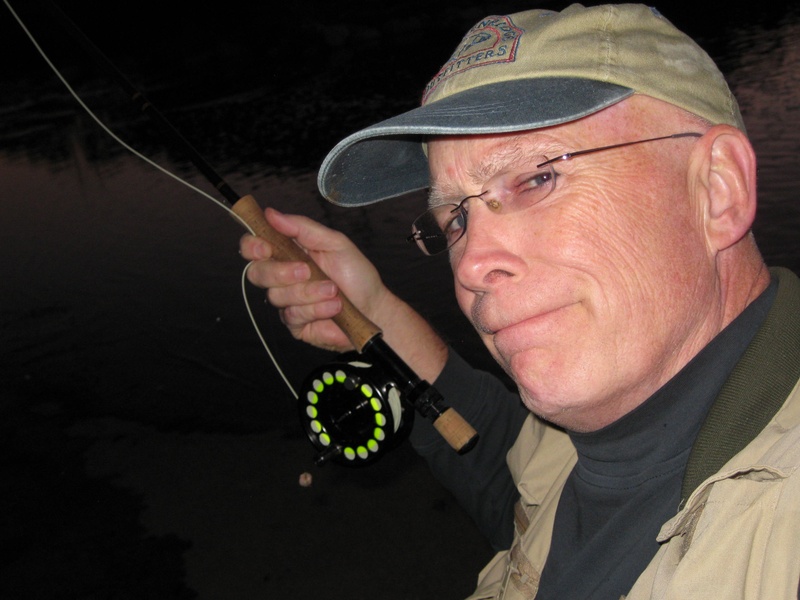 I am excited to have found another fly-carpin site. Looks like your home water is pretty hard-core. Welcome, Trevor. Glad you found us!